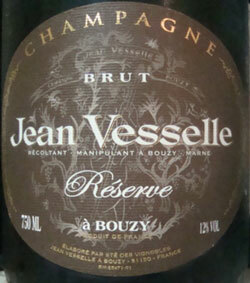 Jean Vesselle is a Grower-Producer in Bouzy, making Bouzy style powerful and masculine Pinot Noir dominated wines. This family estate is over 300 years old and the winemaker is Delphine Vesselle sinve 1996, Jean's daughter. It encompasses 2 plots of vines in Bouzy. The wines have been referred to as structured similar to red wine, and I'm in complete agreement. It's interesting that they are the only Grower Champagne I found during a recent trip to South Africa, not that I was looking for them there. Grapes are harvested manually, and then pressed immediately in two pneumatic presses. Fermentation for most wines takes place in temperature controlled stainless steel tanks (thanks to a big cellar upgrade and modernization in 2007). Brut Reserve - A very big Pinot Noir dominant wine. 80% Pinot Noir, 20% Chardonnay, with 11 grams/liter of dosage. Tasting note below. Brut Reserve - Similar to the Brut Reserve above but with zero dosage. Rosé de Saignee Brut - A rose made by the Saignee method of skin contact (24-48 hours) to derive the rose color. 100% Pinot Noir with 9 grams/liter of dosage. Demi Sec - Another demi-sec, this one is not a rose, and made of 80% Pinot Noir, 20% Chardonnay, and with 35 grams/liter of dosage. Sec - Similar to the demi-sec above but not as sweet with 20 grams/liter of dosage. Oeil de Perdrix Brut - A 100% Pinot Noir Blanc de noirs wine, aged 2-3 years minimum and with 6 grams/liter of dosage. Prestige - 100% Grand Cru Bouzy fruit, 70% Pinot Noir, 30% Chardonnay, aged a minimum of 8 years, and with 7 grams/liter of dosage. Prestige Millésime - Their vintage wine, 70% Pinot Noir, 30% Chardonnay, aged a minimum of 8 years, Only made in great years and from plots on Bouzy with excellent exposure. Le Petit Clos - 100% Pinot Noir, aged a minimum of 10 years, and with a very low 4 grams/liter of dosage. From a small walled vineyard, about 8 hectares, in the heart of Bouzy, and aged in small oak barrels. Click Here for their French language Website. Bpuzy is known for big, powerful, Pinot Noir dominated wines, and this didn't dissappoint, being ever bigger and more powerful than expected. The nose had peach, deep minerals, beef carpaccio, and a touch of apple in each when first poured before the bubbles subsided. The palate was big and bold, with big apple, certainly some cherry, nuts, peach concentrate, and sweet red fruits. A lot of peach in this big wine, which could certainly standup to big food, as well as age gracefully for a few years.